The term “global warming” may seem like a misnomer when the temperature has been dipping to -20 C or lower. But whether you call it a cold snap, a polar vortex or climate change, let’s face it-we Canadians are getting some extreme cold this winter. This deep chill is creating slick conditions for Ontario motorists. And if you think that applying more salt to the roads is going to help, think again. A recent report by Global News pointed the finger at cold weather for a 10-car pileup on the Gardiner Expressway earlier this month. The temperature had dropped to -22 C overnight and when it’s that cold, salt just doesn’t work. While salt is effective at removing frost and snow and breaking up ice packs on pavement, the conditions and timing must be right. When salt is applied to roads, the aim is for the salt to dissolve and form a solution of salt and water-called brine-that melts the snow or ice and prevents it from adhering to the pavement. But salt or brine is not generally used when it’s below -10 C or -15 C due to the risk of refreezing. As the ice melts, more water is introduced to the solution, and the temperature at which the brine will refreeze increases. That translates into slippery conditions. Read more about the science behind this from Environment Canada. These slippery conditions put an onus on both road authorities and drivers. Road authorities need to use other agents such as gravel or sand to help with traction. Motorists need to be aware of the weather and drive according to road surface conditions. Read the Winter Road Conditions Reports on the Ministry of Transportation website, or call them for reports by phone at 1-800-268-4686 (1-866-471-8929 TTY). 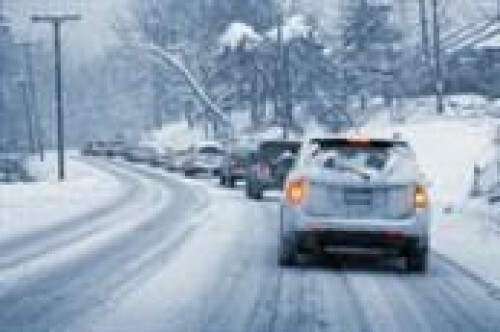 The MTO’s brochure Winter Driving: Be Prepared, Be Safe! contains information about driving safely during winter road conditions, including a section on what the MTO does to control ice and snow on highways. Originally published at www.otlablog.com, re-published by permission from Ontario Trial Lawyers Association.